Today, the dark rainy clouds continue to hang around Nanyuki town making me wonder why I promised Evans our lead guide on Mt Kenya to include me on his Porters team that will accompany him and a group of Five Trekkers for a 5 day Mt Kenya trek via the Sirimon – Chogoria route. It’s apparent to me now that the mountain isn’t going to be short of rain any time soon. But before I ponder this thought further, Evans calls me to inform me that they’re now crossing the Equator which is just a few minutes drive to where we are waiting for them. 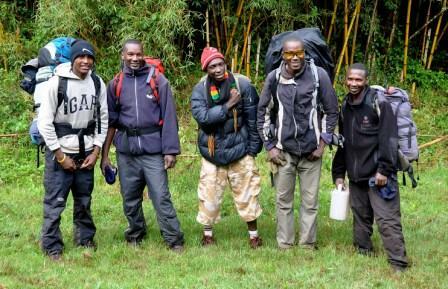 On their arrival, I am already in the company of the team’s cook and the other porters all of who reside in this base climbing town of Nanyuki. As we gather outside the parking lot of the Marina Restaurant, where they normally have their lunch, a safari van honks behind us and on turning, it’s Evans and the clients. They disembark from the vehicle and introductions are quickly made. For now all I can hear around the parking lot are the words “Pleased to meet you, pleased to meet you”. I can clearly see excitement written all over their faces. Evans leads them to the restaurant to brief them and organize for their lunch. He soon emerges and we all share our duties as who is to get what. Shortly, we all scatter in different directions and to regroup at this very point after an hour. I head out to the market to get all the fresh farm produce. I have the list at heart and I sing it out as I do my rounds in the market. Eventually my basket is packed to the brim with our requirements for the 5 days. Time is now slipping away fast and my hunger pains are at it again. I know it’s going to be a tough afternoon so I have to eat all I can lay my mouth on. On my feet, and with all my shopping strapped to my back, my quick tough jaw does it again for me! Luckily I make it back to the parking lot on time. The parking lot is in a bit of a pandemonium now as everyone is busy consolidating their stuff and check listing everything. Eventually everything is packed into the vehicle for the last drive to the sirimon park gate. It’s already heading past One thirty and Evans dashes to check whether they are done with lunch. He emerges shortly with them and shows them to the vehicle. 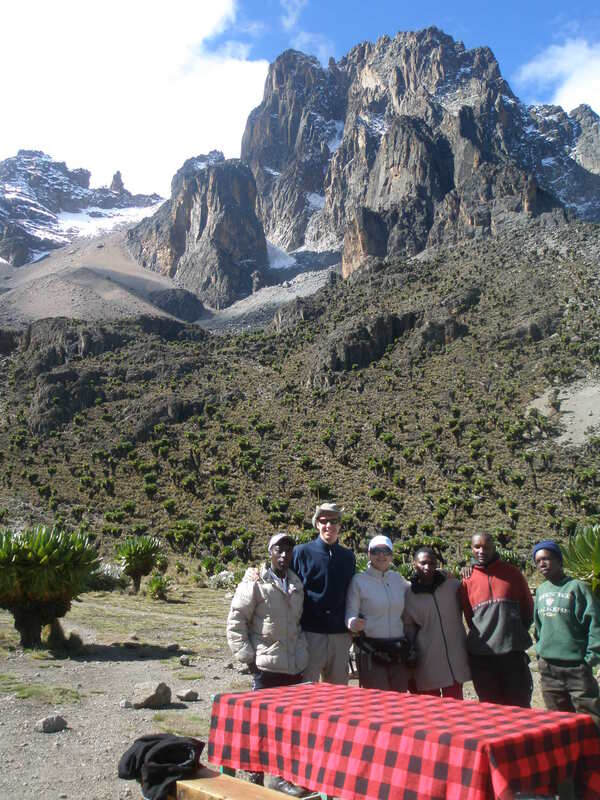 They climb enthusiastically knowing that very soon they will begin their dream trek on Mount Kenya. As we speed towards the mountain, their anticipation is unmistakable! And within 45 minutes we are right in front of the Sirimon park gate. We all climb down the vehicle and unload everything with speed. As Evans clears with the park gate, we are busy sharing out the luggage, an exercise that I must admit is done with its share of complaints. Eventually, I end up with a 35 Lbs luggage even after having played all my tricks! …..this job is not for the faint hearted! Before long Evans and the climbers disappear into the forest with their day packs strapped to their backs. No worries as we will definitely catch up and overtake them soon. I mount up my backpack and blast off the gate with the other porters hot on heels towards the forest. As a matter of fact, there is little comfort in knowing that we won’t be anywhere near home until after 3 grueling hours. For us the catch is to hit camp long enough before the climbers, a task we’ve religiously accomplished over the years. We push our way up the forest blasting past the bamboo and passing our guide and the trekkers on the way. As we hit the higher elevations, conversation amongst us dies out as tackling the steep gradients is energy sapping. Every iota of energy here counts. Unrelenting in our push, we tackle every successive hill sweating like pigs till we approach the home stretch. As we emerge from the sharp climb and negotiate a corner, it’s a big sigh of relief as we sight the roof of the Old Moses Camp. This rekindles conversation between us as our new found energy pushes us up the last hill to the camp getting there on time. We quickly change our sweat drenched garments and gather in the kitchen to prepare hot water for the clients to make drinks once they arrive. We then settle for a cup of black tea before plans for dinner gets underway. We are really grateful to the mountain Gods as we didn’t taste the rains today……the mountain can be very unforgiving sometimes. From the camp, we check out the trail below from time to time to see whether Evans and the clients are approaching. As they eventually approach, we set the drinks on the dinning table awaiting them. We immediately start preparing dinner as it’s our practice to serve it at 6.30 P.M. After serving dinner we prepare our own food and go to bed early knowing that today was just but a child’s play compared to what we face tomorrow. The night passed not without it’s fair share of interruptions especially from the porters’ nightmares perhaps due to exhaustion or fear of a rogue Elephant that has been giving trekkers a scare on several occasions at the popular “kona mbaya”(Dangerous Corner) along the Bamboo stretch. Back to the porters’ bunkhouse. As I stretch my aching muscles hoping that it’s still deep in the night and that I still have more time to sleep, our cook announces that it’s already 6 A.M and that we’re urgently needed at the kitchen to help with breakfast. Apparently, breakfast must be set at the dinning table by six thirty as trekkers are expected to leave camp latest seven as today is gonna be a long day. I brave the dark chilly morning and head to the kitchen. Everybody to his own tasks. Surprisingly, we deliver breakfast in real time. You see, today is the day no porter ever takes lightly. It’s a BIG test of stamina, speed and will power. Most new porters decide today whether this job description fits them. As we put it, it’s the day that we see the Elephant! Picture this, forty pounds of luggage on your back to be hauled for seven hours through thinning air with an eventual elevation gain of eight hundred meters. Not to mention that we have to hit camp two hours clear of the clents! If you fancy that, WELCOME to our world! Back to the camp’s kitchen, a pandemonium ensues as porters literally scramble for a bite of whatever passes up this way to top up our stomachs. A full stomach comes in handy today. By this time, the clients are already done with their breakfast and Evans assembles them outside so they have an early start and off they hit the trail. We quickly clear the utensils from the tables, clean them, pack the climbers’ trail lunch, and finally consolidate and share out the luggage with the usual complaints. From here it’s every man for himself! Off we go and it’s uphill for an hour to our first stop, popularly known as the junction. Evans and the clients are already here and are enjoying their water break. To avoid extra water weight on my luggage, I drink enough from the small stream running through here as the other porters follow suit. Before we leave, we reassure clients that all is going to be well with them and hope to see them again at the rocks for lunch. We hit the track on a flat stretch to the Ontulili River, with a gradual climb and a long contour leading us down a steep slope to the Liki North River… another watering hole for us. Guess what? We are now at the bottom of today’s Mother of all climbing! We hydrate as we brace ourselves for the tough gradient ahead. It’s done in little parts with intermittent breaks till we conquer the whole lot. Oxygen is a rare commodity here and we on many occasions find ourselves panting and gasping for air which becomes thinner with every successive step. At some point, I find myself asking why I’m doing this with the answer being the same…because I love it! I’m sure the same is true for the rest of the porters and that’s why our final push finally sees us to the top of the hill. Panting! We scatter ourselves on the rocks as we lie in wait of the clients. This is where we’ll serve clients with lunch. As we start to freeze and wonder what’s happening to the clients, another group of porters arrive with relieving news that our clients aren’t far down from here. After about a half hour, they eventually emerge from the mist below and it’s apparent they’ve taken quite a beating! Oftentimes, this is the point at which we all give a pep talk and a nudge to the clients…a little encouragement goes a long way. Depending on the Guide’s assessment of the clients’ condition, this is the point where one of us may be called upon to be left behind to accompany the group. Just in case. After serving lunch, we quickly drop down to the spectacular Mackinders valley knowing that the hardest part of the day has been conquered. All that remains now is a speedy cruise to the Shipton’s camp. Nonetheless, for the rest of the journey we keep our fingers crossed hoping that the rain Gods continues to hold back the rain. We speed through the Lobelia plants and tussock grass as stories and gossip abound eventually climbing up the Shipton’s caves from whence our next home is visible. From here we do our final stretch leading us to the Shipton’s camp. Luckily without a drop of rain! Before the other teams of porters arrive, we speedily settle at one of the best corners of the kitchen as we will be around for two nights. It’s time to separate the luggage and take the clients backpacks to their beds as we take the food to the kitchen. Everyone is now in high spirits as we stroll around the camp and back to the kitchen. It’s time to prepare the tables as we anticipate clients to be back from their day hike in an hour’s time. At the tables, we set boiled water, pop corns and biscuits for their refreshment. Back at the kitchen, we enjoy our cup of Tea as we review Dinner’s menu. We rush outside and spread ourselves on the rocks to catch the ever elusive rays. Nobody moves as we’re all immersed in enjoying the rays beating on our bodies giving us back a sense of life…a well deserved relaxation at last! However, this session doesn’t last long as a whistle disrupts us as we were finally dozing off. On opening my eyes, it’s Evans with the clients streaming slowly into the camp, most of them somewhat BEAT! As Evans shows them to the dinning, we all rush to the kitchen to bring the snacks we’ve prepared for them but Evans interrupts us with the news that we have several cases of headache. I quickly prime the Stove and within a few minutes I have lemon Tea ready for those with headache. After moments with the clients, Evans joins us for an update of what has been going on with the clients. He has his stories too. I wish he’d give you a sneak preview of his experience with them too. It’s fast heading to six P.M and the Sun is going down pretty quick. We dash into the kitchen to start preparations for dinner. The Cook is now on top of his game as we gladly take his orders and within no time everything is chopped up and ready for his cooking. A task we all respect him for. The kind of stuff this guy cooks is probably served in Heaven! Eventually everything is ready and we deliver it to the table. As they continue with dinner, we settle on preparing our local stuff, the ever popular “ugali” -made from corn flour. Very filling stuff but the taste is nothing to write home about. I make my rounds in the kitchen showering praises to the other groups’ cooks, a trick that avails me the opportunity to sample their tastes. My visit to the table confirms that the clients are done with dinner and I call my colleagues to clear the tables. All utensils are collected from the tables and clean up ensues. Today is my lucky day as I’m not on the duty list. I finally wash down everything with a mug of hot tea and head to the bunkhouse to catch the latest in the dream world. Adios! “Lala Salama”- Good Nite! See you tomorrow when we embark on our 3rd day! I open my eyes to the bright rays of sun rise and notice that I’m alone in the bunkhouse. Before I jump down I suddenly recall that today is our lazy day as the whole day will be spent here at camp while Evans takes the trekkers for a day hike to acclimatize properly. I head to the kitchen where I get the other porters seated around the burning stove. It’s only seven A.M and Breakfast is to be served in an hour’s time. The climbers are still in bed and we are all hoping that they wake up in good form. Within the next half hour, I’m playing busy with breakfast. Eventually everything is ready and kept safely as we wait for the climbers to wake up. Meantime we prepare ours too. Before long, Evans tells us that they’re already at the table and we quickly deliver their breakfast. At around ten in the morning, Evans takes the climbers for a day hike as we remain behind to prepare lunch as it’s the time that they normally get back to camp. As they leave for the hike, most of us rush back to the bunkhouse for more dreams. Time for preparing lunch gets me deep in sleep as the cook pulls away at my sleeping bag. After a big click I nevertheless follow him to the kitchen… within no time lunch is ready. We quickly serve lunch and rush outside in search of rays. From the rocks we watch other groups literally limp to the camp. We lazy around till the sun go down, after which we get back to the kitchen to organize dinner. I light the charcoal burner and carry it to the kitchen. Today, we serve Dinner early since the climbers will leave for the summit attempt at three A.M. We too sleep early as we expect to leave by the crack of dawn. Tonight I’m very keen on overloading my guts as the first steps in the morning will be quite an ascent. I do my final round in the kitchen and head to the bunker! It’s a very chilly night and I curl myself in the sleeping bag, but with the help of my full stomach it doesn’t take long to doze off. Have a lazy day too! Join me at the crack dawn as I see the clients off to the summit. Will they make it? Let’s hear it tommorow from Evans the guide. The cracking of the beds in our bunker interrupts my peaceful sleep and with a hazy feeling I can hear our team cook talking in whispers with the guide. All this seems like a dream but I soon realize that it’s already two in the morning and the climbers are already up for a cup of tea before they head out for the point lenana summit attempt. As their conversation continues, I slowly drift back to sleep and the next thing I know, my colleagues are pulling away my sleeping bag as it’s already 6 AM. It’s time to hit the trail! Everything is done pretty fast and I soon find myself outside braving the freezing morning. By now I figure that the climbers are almost making it to the summit. 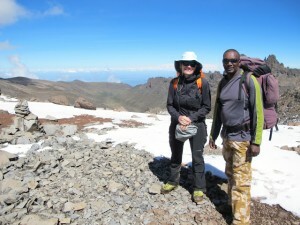 From Shipton’s camp we head west for abut a hundred meters before starting on our steep ascent to the top of Simba col – a place that porters once claimed to have seen a lion! Thus it’s name simba (Lion). This is the last tough gradient that we tackle and I do it with a lot of zeal knowing that from here it’s now down hill all the way. As we do the final touches on breakfast, the climbers stream in… Walking wounded! And from the look of their eyes, I bet that some have been crying up there. It’s quite normal and they do it often. Meantime, we give them time to cool off as we leisurely set their breakfast. Eventually they recover and start to devour their breakfast as we prepare ours. It’s going to be a long day and as usual, eat as much as I can. Once climbers are through with breakfast, I pick what belongs to me and it’s a great down hill trek to the Road head where we serve lunch. This section gives my knees quite a beating though I make it to the road head before one o’clock. A 10 minutes break is all that’s needed for lunch preparations to kick off. We get down to business and within the next hour everything is ready by which time, the climbers come cruising down arriving slightly past two PM. Judging by the way they are eating, it’s evident that the down hill cruise really whetted their appetite. By now the clouds are making funny formations giving a rain scare. This make everyone speed up on what they’re doing and finally make our last trek to our next home. The Bandas Lodge. We pick one of the Banda and set ourselves up. So far everyone is edgy due to hunger and we hurriedly get down to some tea and bread crumbs. With some scramble, I get my share. While scrambling we don’t take it personally! My duty today is to make dough as dinner will comprise of the all popular African Chapati. I do it with a lot of zeal hoping that the smarter I work the higher the returns will be. Everything is ready and we hand over to our cook to give his magic touch. I hover around this guy giving a hand now and then knowing that eventually he will avails me a chance to exercise my taste buds. As cooking progresses, I’m busy with firewood making some log fire for the climbers to warm themselves. Soon some are enjoying a cold beer by the fire place. By 7 P.M dinner is ready and served. Meantime the other porters take turns to prepare our last dinner. I’m out of duty now as I gave our cook a hand in the earlier session. As our food cooks quietly over the stove, stories touching on different topics arise, the content of which can only be disclosed with porters’ permission. Believe me, it’s Tabloid stuff! I don’t even realize that time is passing until it’s confirmed that our dinner is actually ready. I take as much as my stomach can hold as Bandas Lodge at night is very cold. After dinner, we head to our bunker taking care not to run into the Buffaloes that roam hear at night. It’s a cold night as usual but I drift to sleep anyway knowing that tomorrow I sleep on a proper bed after a hot shower at home. As I make a turn on the hard surface, I realize that everyone else is up and folding their belongings, I hasten myself and soon we all head to the kitchen to make the final breakfast. By the time we enter the Banda’s kitchen the climbers are still asleep. We are quick with breakfast as not much energy is required today. Within a short while, everything is set at the tables. As we wonder on the best way to wake them up, I start singing in whistles to catch their attention, luckily my trick works! And they come streaming to the dinning. We serve them breakfast and get down preparing ours too. Several cups of Tea will suffice for us. We are going home anyway! Our spirit is buoyant as we mount our luggage for the final stretch. By 8 A.M we hit the road. Today we do just ten Kilometers down chogoria route via the bamboo forest to where a four wheel drive picks us up. In two hours time every body is at the ten kilometer mark and climb to the waiting vehicle. Driving down the forest, I cannot help wondering when the next trip will be. But before then I’ve a smelly back to take care of. On the wrap-up I chat up the climbers as we enjoy the ride out. By the way we converse, I can tell that they are happy and satisfied with our service. After all, mountaineering is no easy undertaking. Finally we are signing out at the chogoria park gate and a twenty minutes drive takes us to chogoria town where we all unwind as we enjoy some refreshments after which tips are dished out. We bid them goodbye as they proceed to Nairobi and we head back to Nanyuki. My best wishes as you plan your trek up Mount Kenya.